Today’s guest picture comes from Sandy’s Mexican adventure. He ran into this cousin of Mr Grumpy while he was there. The new year continues to put on a cheerful face and we had another bright and sunny day today but it was cold after a clear night and the temperature in the shade outside our back door only just crept above zero. The wind was light though so being outside in the sunshine was a pleasant experience. 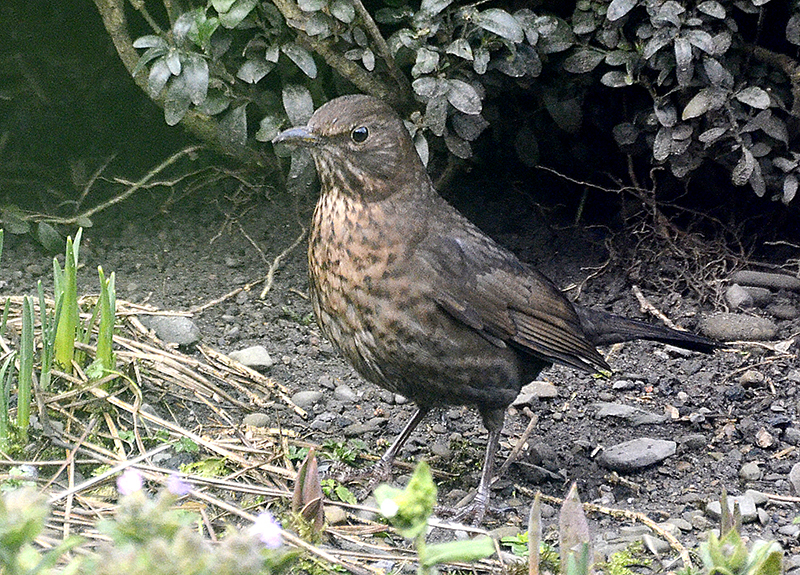 It was Sandy’s day to fill the Moorland Feeders and he kindly picked me up on his way. We filled the feeders and sat for a while in the hide but the bright sunshine was not much help to us as it shone straight into our faces…. …so with the cold air nipping at noses and fingers, we didn’t stay too long. Sandy went on home and I was joined for coffee by Dropscone who told me that he is going to have a golf lesson tomorrow. It just shows that you are never to old to learn…or at least he hopes that that is the case. …including one with a lot of white feathers. But there were plenty of birds to look at even though some made it hard to pick them out by lurking against a neutral background. I have put some fat balls in an open feeder and they drew in some customers. They were easier to spot. In spite of the frost, the vegetable garden was soft enough for me to dig up a leek so I made some soup for lunch and then Mrs Tootlepedal set off to Lockerbie and Edinburgh to see Matilda. I set off to make the best of a sunny afternoon and walked up to the monument on Whita Hill. It is quite a stiff climb with a gain of 843ft in almost exactly a mile from the Market Place to the summit which gives an average gradient of 16%. However, with the ground very solid underfoot because of the low temperature and with the aid of a couple of stout walking poles, I arrived safely at the summit…. 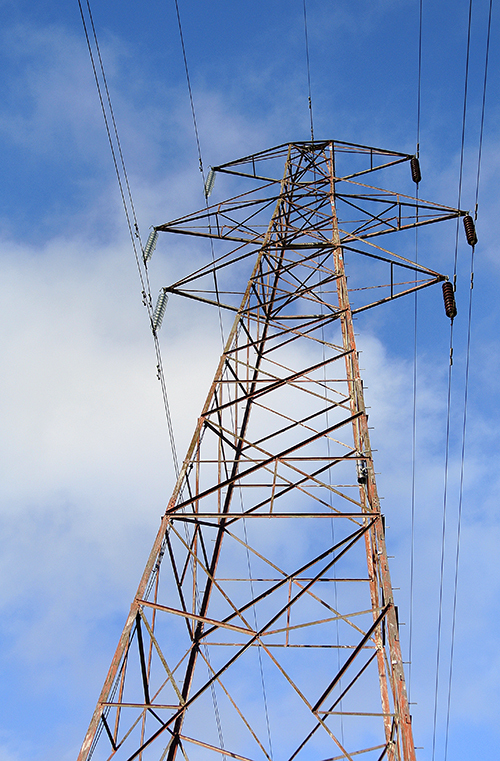 I had passed the inevitable line of pylons on my way…. …and looked south to see the Lake District fells, just visible above a very misty Solway plain. 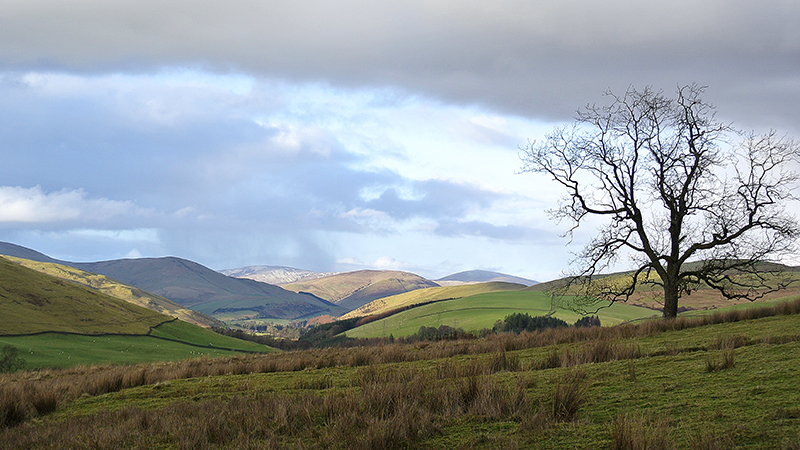 …and Castle Hill and the Eskdale hills beyond it. It was a big sky day. In the other direction, the colour changed dramatically as grouse moors came into the picture. And I could see the fields at Cronksbank on the far bank of the Tarras water. 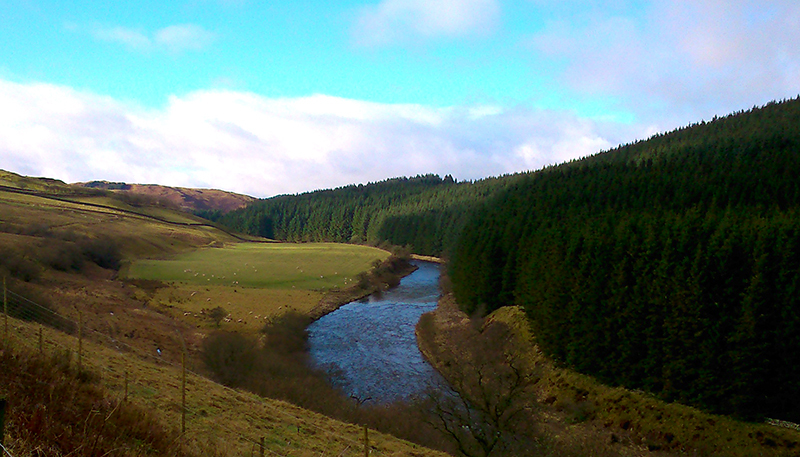 But my favourite view, as ever, was looking at the hills that line the Ewes valley. Very wisely, I decided not to test the knees on a 16% descent and tacked down the hill by track and path. 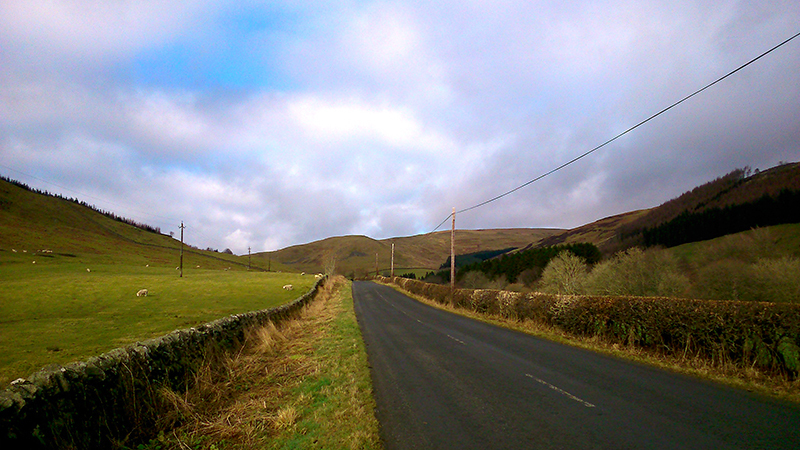 This added just over half a mile to the route back to town but took 6% off the gradient so it was a good bargain. I should say that the walking poles added considerably to the pleasure of the walk not just by helping to push me up the hill but by stopping me slipping back down it. I know that there are people who are too proud to use walking poles but I am not one of them. I didn’t wander lonely as a cloud as I met other walkers on my way, including Kenny, a fellow camera club member, who tells me he is up this hill almost every day. He is a great bird watcher and sees many interesting things through his binoculars which would pass me by entirely. If it is not close enough to snap, I probably don’t see it. …he was probably thinking that it would be a lot warmer in Mexico. As Mrs Tootlepedal was away in Edinburgh and I was a little tired after my modest 3½ mile walk, I nipped out to the chip shop and acquired a pie and chips with some curry sauce for my evening meal. It went down very well. A guilty pleasure as they say. As I mentioned before, when I was looking for the flying bird of the day in the morning, some birds were too dark and some birds were too light but like Goldilocks, I found one that was just right. Today’s guest picture is another from Mike and Alison’s New Zealand adventure. Mike thought correctly that it might warm me up. He tells me that it shows Mapua with Rabbit Island in the background. At the other end of the earth from Mapua, we had a suitably dark and grey occasion here as we approach the shortest day. Sandy has been suffering from a cold too but he was improved enough to venture out for a cup of coffee this morning. Mrs Tootlepedal had made some mince pies last night and these went down very well with the Monsoon Malabar. I took a moment to look out of the window after coffee and was rewarded with a display of landing skills from the chaffinches. And a chaffinch posed prettily for those who like a more restful bird shot. Over lunch, Mrs Tootlepedal went off to be a volunteer at the Buccleuch Centre and I thought that a walk in the woods might be a good idea, especially as a friend had suggested a spot where I might find some bullfinches and/or redpolls. I didn’t want to walk too far so I set out in the car to get to a convenient spot but I hadn’t gone far before a slightly stuttering engine and two warning lights suggested that a visit to the garage might be prudent. As I was just outside the garage when the warning lights came on, this wasn’t too difficult to arrange and having the left the car in the care of the mechanics, I walked on regardless. 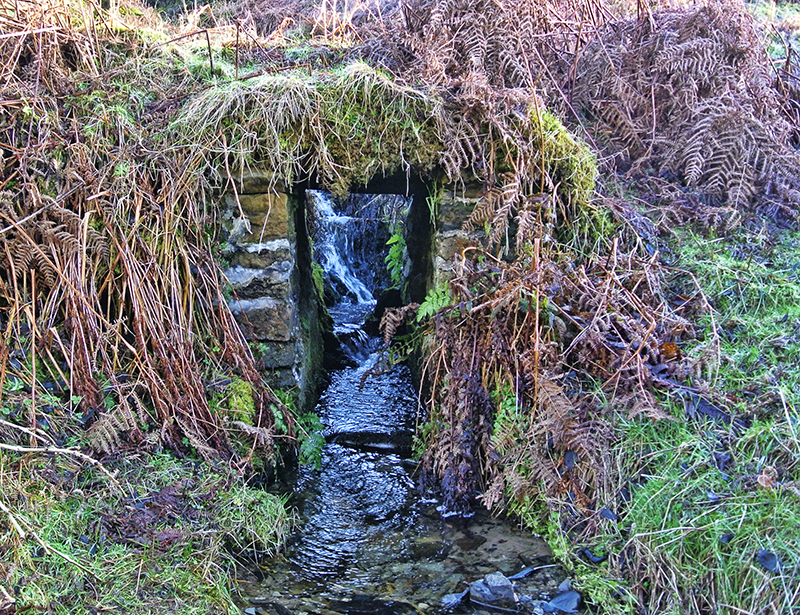 A walked up Hallpath, past an intriguing wall…. Why the same wall should be so different just a few yards apart is a mystery to me. …until I came to the spot where the birds might lurk. There were certainly a good number of small birds high in the trees but the light was so poor that I had no way of telling what they were. 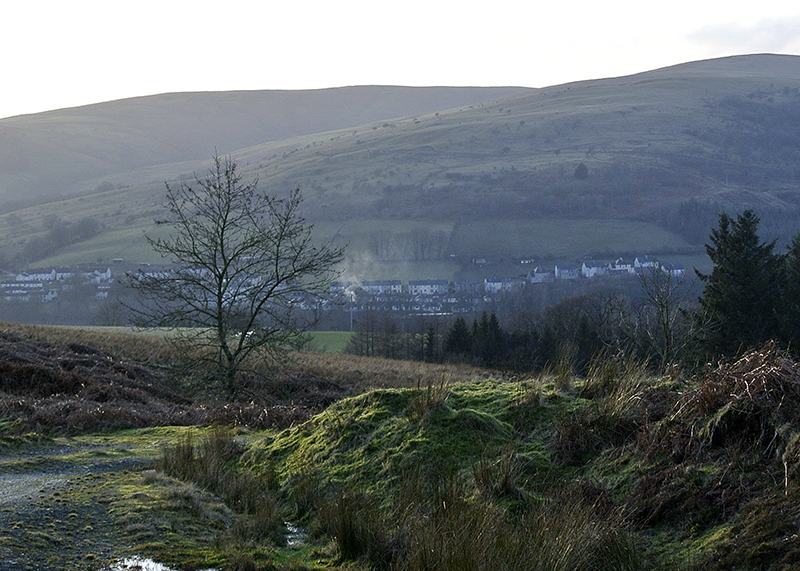 I turned off the main track and struck up the hill towards open ground…. It’s a wonderful spot for electricity wires getting in your view. …but even when I got clear of the trees, the view didn’t improve much. …and heading for the pylon on the right…. …and was very surprised to see a gorse bush in full flower on the other side of the wall. 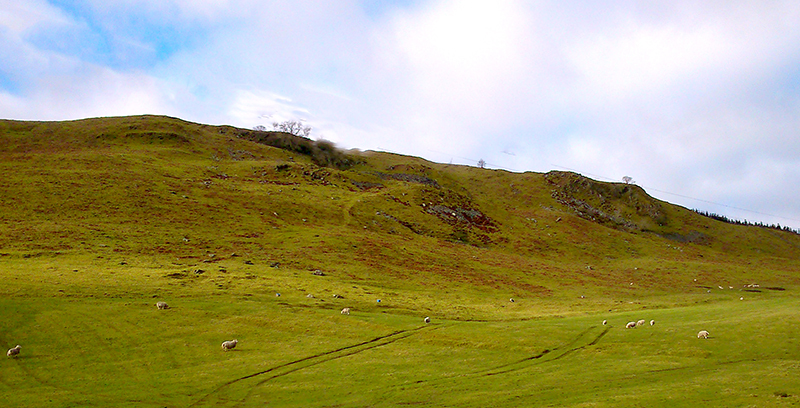 From there, my route was across the face of the hill on the old quarry track. I passed a sheep sensibly lying down with its back to the increasingly gusty wind. 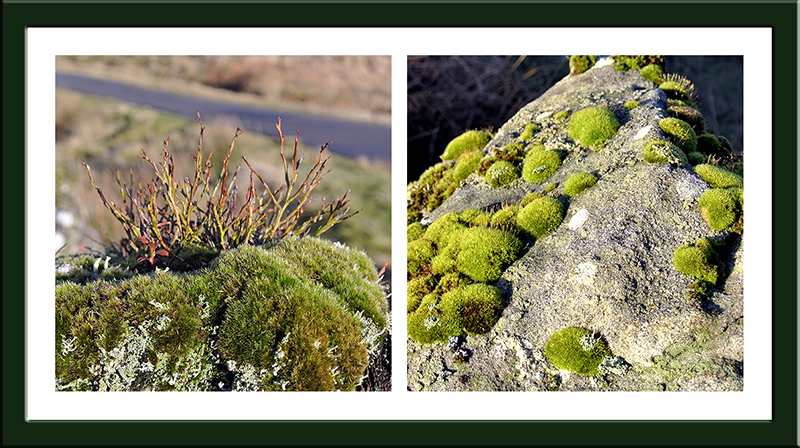 …I dropped back into the town by way of the golf course and the Kirk Wynd. The clock told me that I had been out for just under an hour which was quite enough as it was threatening to turn from mist into drizzle. Beside the suspension bridge as I crossed the Esk, an old friend was standing on a rock…. Facing him, a duck had found a rock of its own. 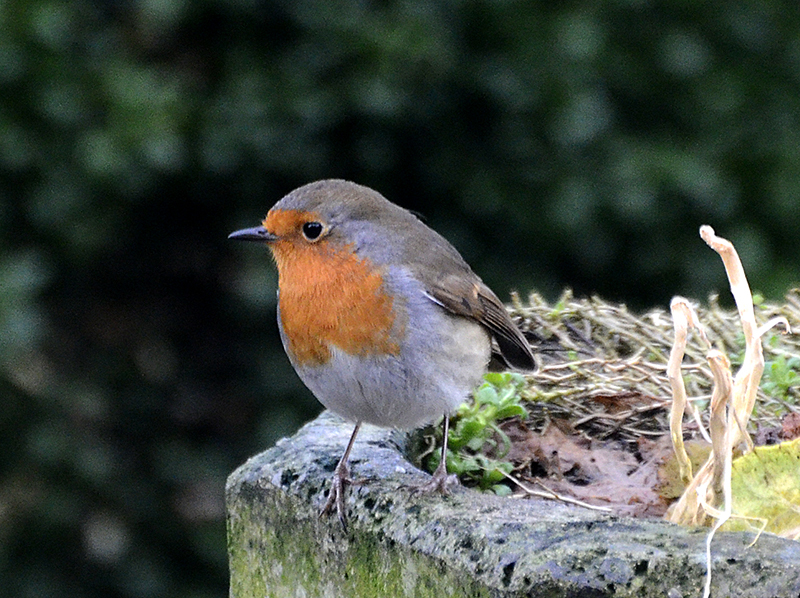 When I got home, I had time to look at a robin trying all the feeders in turn…. …before the light disappeared completely. Although it takes a week before the days actually start getting longer again, it is good to know that tomorrow is the literal depth of winter and it will be uphill towards the sunlit uplands from then on. I got a call from the garage saying that inexpensive repairs were required and these should be completed by tomorrow. I may complain about computers in cars from time to time but it is undoubtedly a good thing to be able to hook up your car to a machine and have it tell you within moments exactly what is wrong. I am still suffering mildly from my cold and so the rest of the day was spent in gentle activity indoors until we went off to a film in the Buccleuch Centre in the evening. As the film was White Christmas, this turned out to be a cheerful way to round off a dull day. 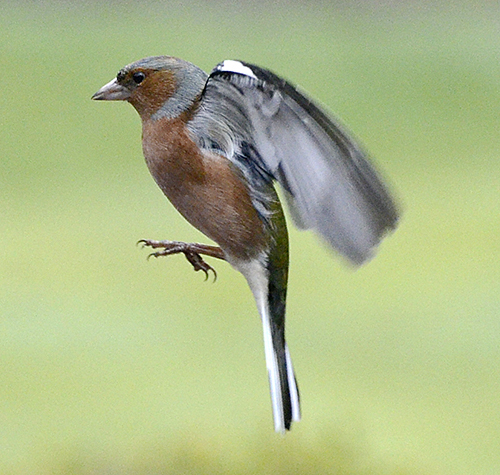 …and the flying bird of the day is an expansive chaffinch. 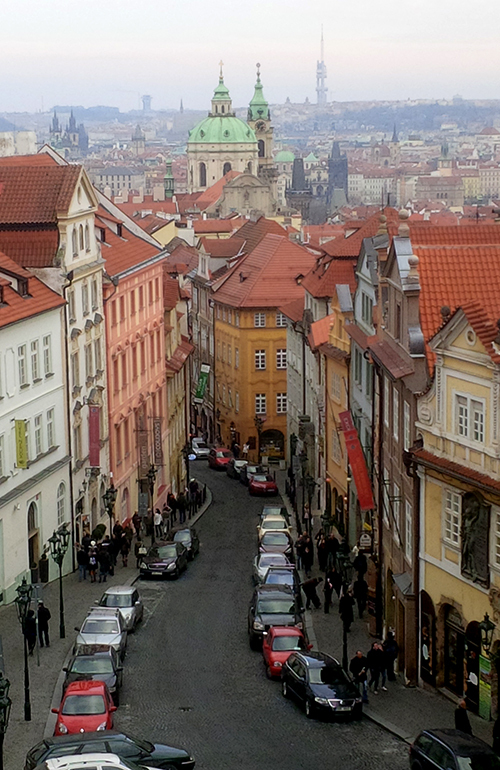 Today’s guest picture is the view from my older son’s hotel room in Prague where he is spending a romantic weekend with his partner. You may think he should have gone next weekend when it will be St Valentine’s Day but he was sensible enough to check the prices first. We had a good day. In between the series of wet and windy depressions rolling over us, we had a good day. We saw the sun. The wind didn’t blow very hard. People were wandering around in a daze wondering what had happened. Did I mention that we had a good day? Dropscone, who has had a very busy week with things that had to be done, had yet another of these things to do this morning so I was able to sit around waiting for the temperature to get above 3°C. I had time to look out of the kitchen window. A robin waiting to dart up to the seed feeder above. When the temperature had hit 4°, I put on my many layers, got the speedy bike out and set out for a circular run round Bailliehill and Paddockhole. This route starts with a stiff climb followed by a descent which loses nearly all the altitude that you have just gained and then eight miles of gentle climbing. As I also had a light breeze in my face, I took my time over this section and stopped from time to time to take a picture with my phone. In spite of the wet weather and the grey skies, the countryside is still looking remarkable green and it was a real pleasure to pedal along with the sun on my back surrounded by gentle hills and serenaded by the song of birds. 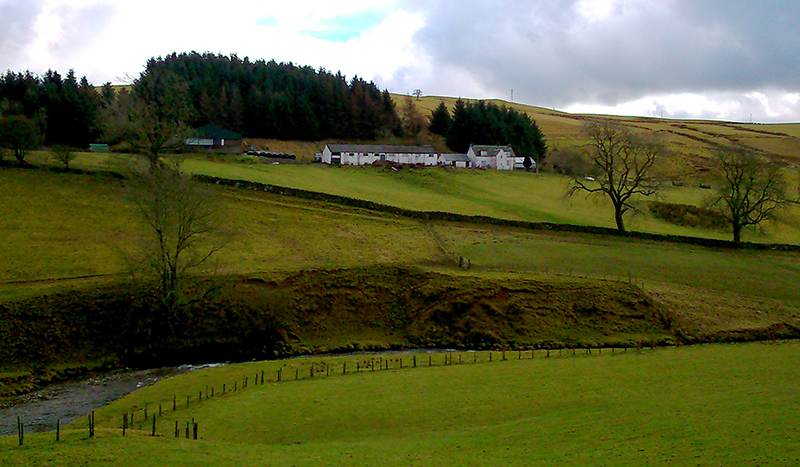 A typical hill farm near Paddockhole. After fifteen miles into the wind, I was pleased to turn at Paddockhole and get the wind behind me for the ten miles home. Much of the road surface for the first half of the trip is very poor and non cyclists may be surprised how much this slows you down but you expend a lot of energy going up and down over bumps. As a result, I had to pedal like the clappers for the last two miles to sneak in at just under the two hours for the twenty five and a half mile trip. I had time for lunch before my friend Jean came round to get a bit of help looking for an embroiderer’s magnifying floor lamp. She has been using mine recently but wanted to have one of her own. We were able to find a suitable item on the internet and it should arrive soon. I often get annoyed when a beautiful view which I wish to photograph is marred by pylons and electricity lines but it is the price to pay for being able to complete transactions like that from the comfort of your armchair at the touch of a button….and of course to put the experience in this post. After Jean left, Mrs Tootlepedal and I decided to go for a walk to take advantage of the better day. I was going to show her the walk that Sandy and I had done a few days ago. This is a walk that she has never been along herself so we drove up to Whitshiels and parked the car. As I pulled the handbrake on, it started to rain. We had an umbrella and the clouds seemed to be moving past so we braved the elements and set off anyway. This turned out to be a good decision as the rain soon stopped and the sun came out. 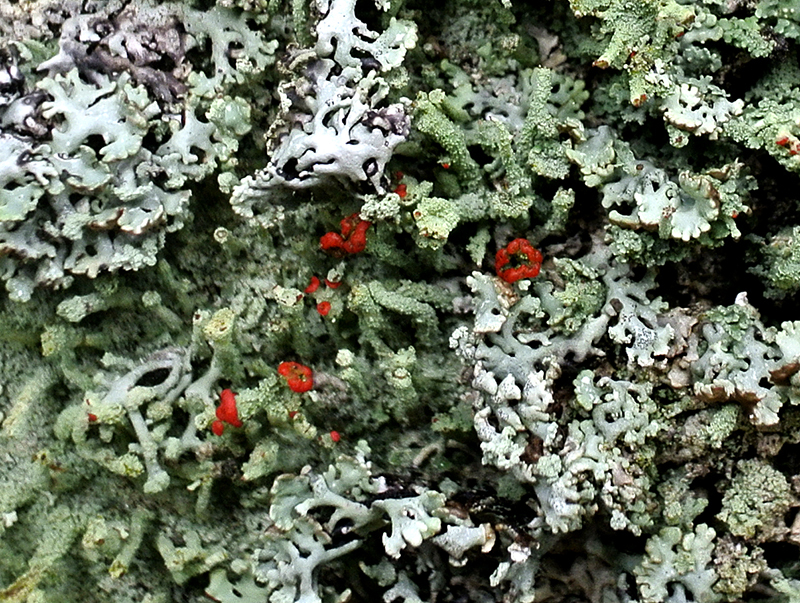 I showed her the little lichen garden on the gatepost which I had noticed before. 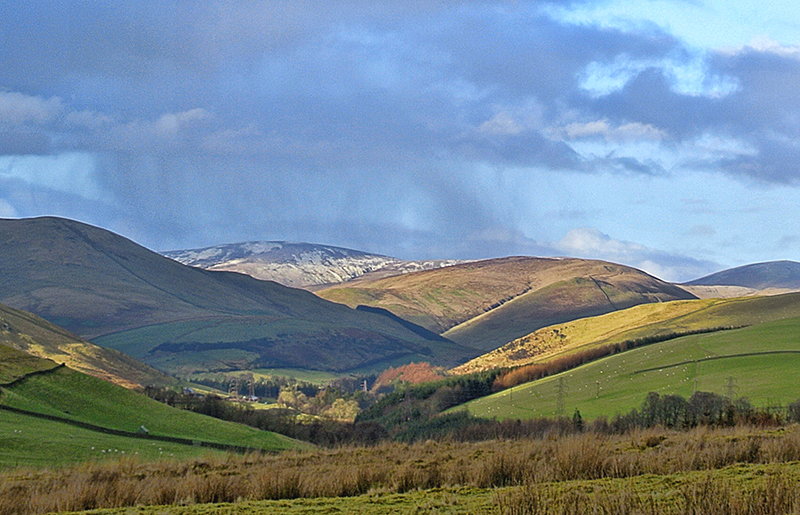 Looking up the Ewes valley, we could see snow on the hills at Eweslees. Thanks to the protection of a nearby wood, there was no wind at all where we were walking and in the sunshine it felt like a spring day. 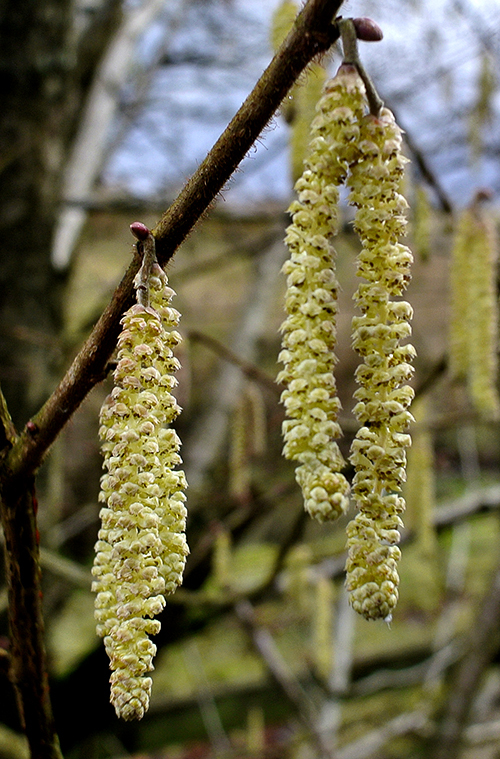 There were certainly signs of spring about. 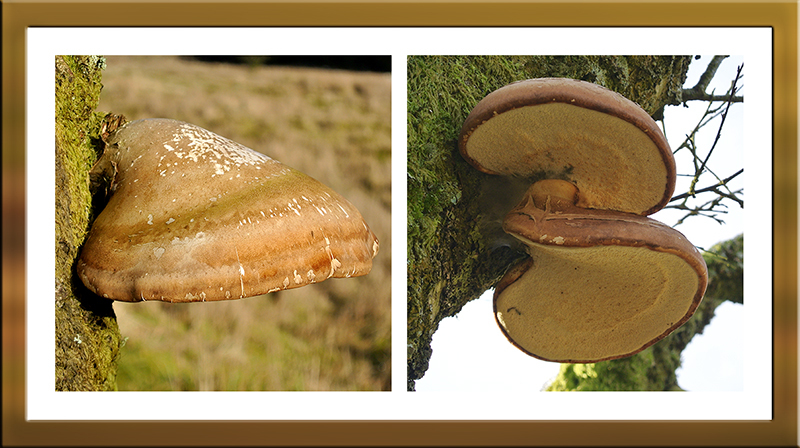 We walked on up the hill to the open fields and I showed Mrs Tootlepedal the impressive birch polypores which Sandy had spotted on our last visit. This is a magical spot on a nice day. Even a conspicuous row of pylons can’t spoil it. 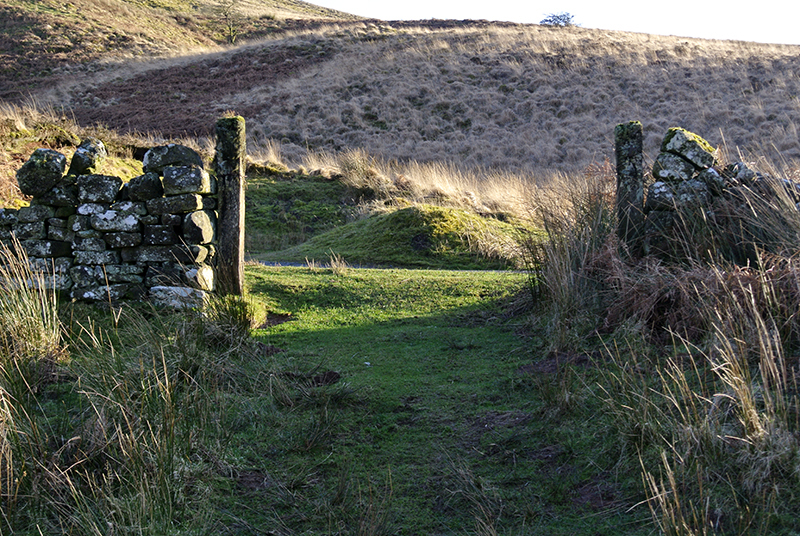 We walked on, leaving the sheep cropped fields, and followed a rough track through the hill pasture until we reached a gate onto the road back to Langholm. The gate itself was worth a look with a small willow bush on the gate post on the left and a pretty moss garden on the stone pillar to the right. We stopped at a quarry beside the road on our way back to the car. It has a little bridge over a stream that must have had some purpose when it was working. 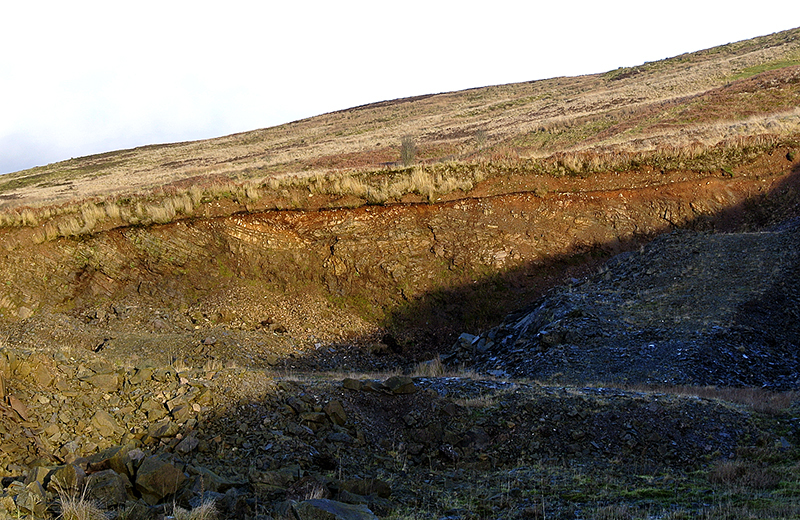 The bank at the end of the quarry shows very clearly how neatly the ice sliced through the strata and smoothed our hills in the last ice age…..
…and just how long it has taken for a very thin layer of indifferent soil to accumulate on top of the rock since the ice went. 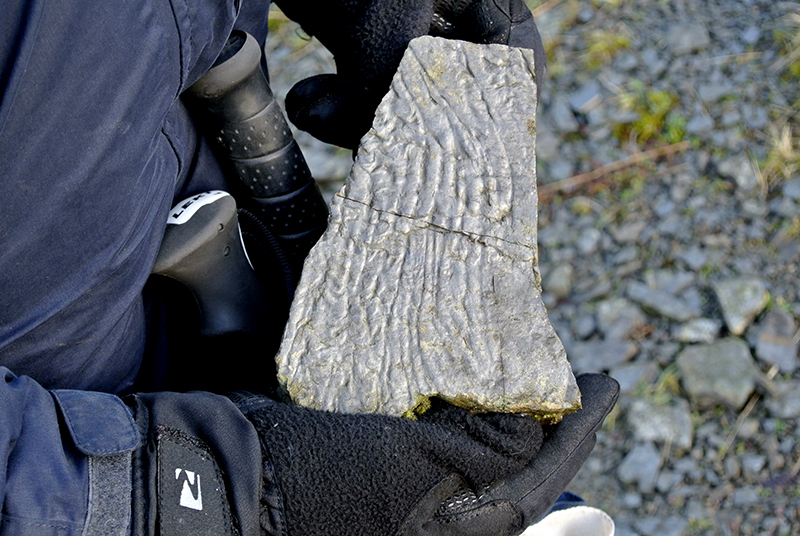 The rock was sedimentary and Mrs Tootlepedal found what looks like a record of ripples long past. By this time, the sun was sinking in the west and it was time to leave the quarry and head for the car, home, and a nice cup of tea. The rest of the day was taken up with dipping into the opening ceremony of the Winter Olympics and cooking a healthy meal of fish and vegetables for my tea. I had taken so many photos after the poor weather of the past few days that it took me ages and some grief to decide which to keep and which to throw away but I still only had a standard flying chaffinch for the final picture of the post.